Wouldn't it be cool if the snack aisle of your supermarket had bags of delicious cauliflower? Alas, you are going to have to break out your kitchen knife and make your own. Cauliflower is one of those veggies that takes on the flavors you add to it. I find it pretty tasteless on its own and its raw consistency can be, well, strange. The key to great cauliflower is to season it and then cook a TON of it for later snacking. If there is a container of roasted cauliflower sitting in my refrigerator, I will eat it before I touch anything else because it is so yummy. This roasted cauliflower recipe is definitely for kids because they can get involved doing the mixing and spreading the cauliflower out on the pan. My kids will eat this if they had a hand in making it - and I convince them it will taste as good as a cookie. There are two steps to this recipe and the first requires marinating. I know it is onerous to marinate food, but in this case it does make a difference. The good news is you can make a tray of this and it will last at least a week in the refrigerator. The extra work will pay off! To make this recipe into a more adult flavor, add the pepper. The pepper makes it spicy so you have a sweet and sour taste that is divine. It also makes a great party snack and you can make it ahead and just serve it from the fridge. Chop cauliflower into small florets. Preheat oven to 450 F. Mix ingredients together in a large bowl and marinate for 20 minutes mixing once. Place on aluminum foil lined, rimmed baking sheet and roast for 20 minutes. Serve hot, cold, or room temperature. Roasting cauliflower definitely improves it by 100%! Is there a substitute for the oil? I am soooo not about the using oil/butter/FAT in cooking. I would like the roasted part but would it be the same texture/consistency if using a "spray" or something comparable? @Amy - try it on parchment paper without the oil - I think it would work great! Is there something I could substitute for the soy sauce? It's a headache trigger for me so I tend to avoid recipes with it, but this looks so perfect for the party I'm having tomorrow! Thanks Snack Girl! @Beth - just leave it out and see how it tastes - would salt work? Try salting after roasting to taste. I have roasted cauliflower in my lunch today! I roasted it on my outside grill with a bit of olive oil and steak seasoning (coarse salt and ground pepper, minced garlic). Yum! Beth, tamari is a great soy-free wheat-free substitute for soy sauce. Amy, you can buy coconut oil as a spray which produces the same effect without the oxidative damage of other seed oils. @Janine, tamari is wheat free but it does contain soy. Try Bragg's or a little sprinkle of fish sauce. Careful, it's very salty. Tamari is another name for soy sauce. It's slightly thicker, but it is Japanese soy sauce(http://en.wikipedia.org/wiki/Soy_sauce#Japanese_soy_sauce). Trader Joe's sells bags of cauliflower already chopped up. It will save you a lot of time! What's everyone's problem witg veg oil/evoo? I love it! I'll go ahead and try this out this weekend, sounds good. Maybe it'll keep me from reaching for the easiest thing: salty chip type snacks when I need something. brent some people just are not into the oil/fat thing is all...no offense as I am sure all oil is lovely. Is there something I could substitute for the cauliflower? lol just kidding! I'll definitely have to try this. Never thought of using soy sauce, but I do love curry roasted cauliflower! 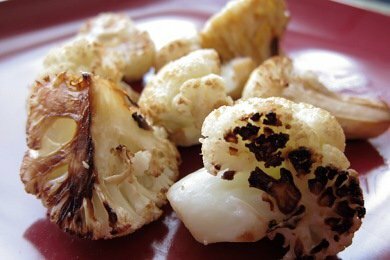 we roast cauliflower with just a toss of evoo and salt. i can eat half of a head by myself!! i just cover a cookie sheet with foil, throw the veg's right on the tray as i cut them up, drizzle the vegs/tray with evoo and salt, and toss it all together right on the tray before cooking.... just use your hands to work it all around, it works best. (and all i have to wash is my hands and a cutting board!) i do this with a number of veg's - whatever we have in the fridge that needs cooking... broccoli, carrots, bell peppers, zucchini, onions, cherry tomatoes... you name it. all different combos work great. don't be afraid to try any veggie this way. roasting adds a whole new flavor and level to vegs. i do pepper it on half the tray for the big people after i toss it around, that way i can be sure i left it off for the kids. i bet the soy sauce adds a nice kick to the cauliflower... i'll try that next time! Kristen J? More info on the curry roasted cauliflower please! Recipe? Curries are seriously as addictive for me as chocolate. Mmmmm sounds great! Can you use frozen cauliflower? It's something I always have in my freezer because at this time of year, the fresh cauliflower always looks brown and unpleasant at the grocery store. @Lavendel, I basically use the same method as this one but sprinkle on curry powder, smoked paprika, garlic, whatever strikes me that night! It's really good! @Beth - I can't have Soy Sauce either because it contains gluten/wheat. I've found an excellent substitute- Organic Tamari Sauce. It tastes just like soy sauce without the resulting side effects. Make sure you buy the organic version. You can find it at most food stores and definitely at any of the healthy food type stores like Sprouts or Whole Foods. Tried this tonight and my just turned-two year old LOVED IT. In his words "mmmmmmm, yummmm, THIS IS GOOD, mmmmmm". I'm soooo trying this one! YUMMY! I love roasted cauliflower. Normally I make it with olive oil, sea salt, pepper, and parmesean cheese. I tried it with balsamic vinegaer and wasn't impressed. I'll have to try it with soy sauce to see how I like it. I roasted cauliflower last night. I tried teriyaki sauce, sugar, and a little black pepper. I roasted mine for about 45 minutes at 450 because I like mine blackened and crunchy. It turned out so good. Even my husband who hates almost all vegetables loved it! I make raw cauliflower also. Just break the florets into smaller pieces and put a gob of nutritional yeast and a tiny bit of salt on it and pretend it's popcorn! This looks so good! I love cauliflower and always looking for ways to change it up!! Try adding a teaspoon of curry powder per cup of cauliflower.....YUMMY!!!! Snack girl! I made this for my family, but I added less soy sauce and some Worcestershire sauce! It was DELICIOUS! My dad said it was the best cauliflower he has had that isn't in something or doesn't have something [cheese] on it! Thank you! I've had cauliflower with Tahini sauce at a Middle Eastern restaurant-anyone tried making that before? I have seen some good recipes for Tahini (the healthy way) on this site and now I'm curious to try it. Ok everyone, I gave this a try last night and was so excited after reading everyone's comments. I had to admit, I didn't see what the big deal was about?? Maybe I didn't have enough soy sauce? I tried to use Pam Olive Oil spray instead of real Olive Oil, do you think that would make the difference?? HELP! @Aubre - it does take some spice to make it pop because cauliflower is pretty bland. Maybe try more pepper and soy sauce. I love all your ideas snack girl! I make roasted vegetables all the time. I use an olive oil sprayer and just mist the bottom of the pan and the tops of the cauliflower to cut down on oil. I only season with salt & pepper and throw a few whole cloves of garlic in the pan as well. Once roasted you can rub the garlic (which is soft) all over the cauliflower for a great taste. This same process works great with brussel sprouts, broccoli, carrots, squash, zucchini - anything!! My kids now eat vegetables since I started roasting! Another substitute for soy sauce is sesame oil, you use a lot less and it has a lot of flavor, with a little salt & pepper. Great on meat too. Great ideas here! Btw, when checking the points value, it's 2. Not 1. I checked it on the WW calculator. Regarding using a spray . .
Why not use a Misto? They sell for about $10-15.00, and work great. It is a refillable can that you can fill with oil , vinegar, fruit juice and spray as much or as little as you desire. You ojust fill it half full, push the lid up and down 15 to 20 times and then it is set to use. Regarding Bragg's Aminos, I love it and use it frequently. It does not have any undesirable additives but it is made from soy, so if you havean allergy to soy, might not be a good choice. I find basalmic vinegar in some instances is a good sub for small amounts of soy. Sorry for the typos. I was posting from my phone and without my glasses. Our family loves roasted cauliflower with EVOO, fresh ground salt and pepper and some balsamic vinegar. The balsamic caramelizes and tastes amazing!